Tame the oil flow for clean, clear skin. While skin care for some requires no extra thought, those with oily skin fight a daily battle against shine. Clogged pores, blackheads and an ever-increasing oil slick may make you feel like putting on a mask before leaving the house in the morning. Never fear. The right skincare products can tame your overactive oil glands and give you clean, smooth skin. Wash your face twice a day using a face wash designed for acne that will remove oil and unclog pores. Look for ingredients such as salicylic acid, benzoyl peroxide, beta-hydroxy acid or glycolic acid, which all get rid of extra oil. Wipe the oily areas of your skin, such as the T-zone, with a medicated pad containing salicylic acid or glycolic acid. 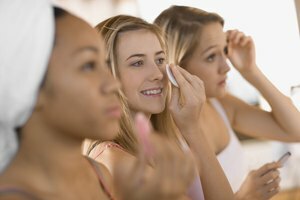 Keep the pads away from other areas of your face, however, because they can be drying. Use more pads as needed during the day, but don't overdo it. Remove shininess during the day with oil-blotting sheets, which are available at drugstores. Press the super-thin sheets against the oiliest places on your skin and pull them away. They take away the shininess without ruining your makeup. Dab acne cream on breakouts once a day to clear them up. Choose a cream containing 5 percent benzoyl peroxide or salicylic acid, which dries out the spots quickly. Apply a thin layer of cream over other blackhead-prone areas to clean out the pores and remove the oily gunk. Apply an oil-absorbing clay mask once a week to remove oil that may clog pores. Apply a thin layer of the mask over your skin and let it dry. Rinse the mask off with warm water and pat your face dry. To further reduce pimples, keep your hair and hands away from your face. If home treatments don’t work, visit a dermatologist, who can prescribe stronger treatments to help control oily skin. Johnson, Kimberly. "How to Keep My Skin Clear If It Is Oily." Synonym, https://classroom.synonym.com/keep-skin-clear-oily-12243.html. Accessed 26 April 2019.